A young Boro squad fell to agonising defeat from the very last kick at Rochdale. Yet it had been a more than useful run out and may have pressed the claims of some of what was a second string Boro. The more experienced players pressed Dale back for a 2 nil lead and it was only when the Boro teenagers came on late on that we surrendered the momentum to an increasingly experienced home side. Last night I joined the Boro travellers on a trek to the ground formerly known as Spotland but now lumbering under the less salubrious title, Crown Oil Arena. The League One side hit the headlines last season by giving Spurs a real scare in the FA Cup. Last night it was a far more friendly affair, but don't tell Boro skipper Grant Leadbitter, he doesn't know the meaning of the word. A crowd of 909 watched Jonathan Woodgate direct a very young Boro studded with experienced hands like Leadbitter, popular keeper Dimi and centre forward Britt. There was a chance to see Marvin Johnson at left back and returned loanees Ashley Fletcher (still 22), Harrison Chapman, Lewis Wing and Julien De Sart (remember him?). The defence was led by young England star Dael Fry who despite facing a wily old centre forward was quite outstanding for 80 minutes. Alongside him was a 16 year old with a big future in Nathan Wood and at no.2, who would have known that Enes Mahmutovic was a centre back playing out of position? He looks an exceptional competitor and player. Julien de Sart demonstrated his passing skills early, when stepping forward from his withdrawn role to pick out former Shildon player Lewis Wing on the left. Wing, who played at Yeovil last season delivered an exceptional cross that big Ashley Fletcher headed home. Great start for Boro. We could and should have been 2 up when Britt Assombalonga smacked a shot off the post. Chapman, making a comeback after a long lay off started to make more and more of an impact and when he fed Assombalonga the referee let himself down by failing to spot a deliberate handball to foil our number 9. A real pearler of a defence splitting pass by de Sart set Britt on his way again. Yet Boro failed to add to their lead before the break. Dimi's goal saw plenty of action in the first 45 minutes yet his defence coped magnificently with everything Dale threw at them. Dimi himself was quick off his line when needed but the most testing moment was when Grant hacked an effort off the goal line. Boro stepped on it after the break with Britt powering on up front, ahead of Fletcher, Chapman and Wing. Johnson started to show more attacking intent and Mahmutovic too moved forward with threat down the right. A wonderful move starting from Nathan Wood, flicked on by Johnson and then worked across goal by Fletcher ended with Chapman striking a shot in his stride straight into the back of the net. 2-0. Assombalonga turned his man but his shot was well saved. He also had opportunities to feed Fletcher but had goals on his mind as he struggled to get past defenders. It was now, mid way through the second half that both sides started to make changes. Boro brought on a series of youngsters, the home side brought on more seasoned players. Connor Ripley had replaced Dimi at half time and made several brilliant reflex saves. Yet the man on the bench at Burton last term was powerless to stop a header looping over him into the net. Boro's young defenders were tiring now and without de Sart as a buffer and less experienced midfielders on we came under pressure. 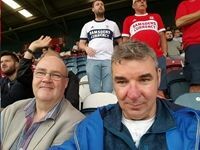 Boro should still have secured a 2-1 win but sadly gifted a chance to the team in blue. Dael Fry was rather fannying around with the ball and was robbed. It still took a good finish to beat Ripley but that was the lead surrendered. Fry hung his head. I am sure it will be a lesson learned, Woodgate would no doubt remind him of that. The Rochdale winner was bizarre. The ball pinballed around the box before being cracked into the net. The referee immediately blew the whistle. I don't think I have ever been to a game before at any level where the the match ended 2 seconds after a goal. So, defeat for Boro but come on it is not the end of the world. It was a young side, featuring many teenagers. There were bright spots. Up until his blunder Dael Fry looked dominant. Alongside him there were real hot prospects in Wood and Mahmutovic. From his seat in the stand, Tony Pulis had a first hand opportunity to see several players that were out on loan last season. He cannot help but have been impressed with some of the touches from Wing, Chapman and de Sart. Ashley Fletcher looked sharp and eager for action. As for Assombalonga, he had plenty of opportunities to score but failed. Yet he is a player that you cannot write off. He might grab a hat trick against Sunderland and then be back in the box seat. Roll on the next friendly at home to Sunderland on Friday (7.30pm).